New Look 6856 skirt which fits the bill of almost any dress code, falling just right at the knee. It's an A-line shape skirt with an elastic waist ensuring flexibility and a feel-good fit. 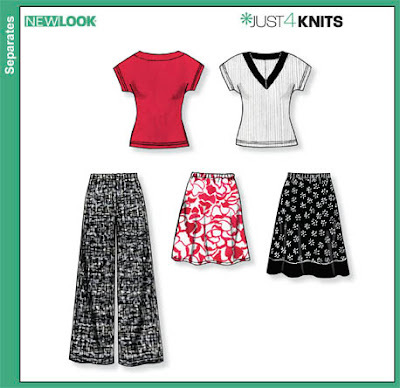 Pattern Description: Misses' knit skirts, pants and top. Pattern Sizing: XS, S, M, L, XL. Were the instructions easy to follow? With only 2 pieces... it was beyond easy. What did you particularly like or dislike about the pattern? The simplicity of the garment. Pattern Alterations or any design changes you made: The pattern was perfect. Would you sew it again? I still have to make skirts for my mom, so I will be pumping out a few more. Lovely job. You look great in them. Hey! That's the same skirt, lol. Very cool. I still haven't run into my key piece. One day soon. Lol looks like we got the same memo on sewing up a storm! What an excellent basic skirt - I can see why you have sewn it up so many times! Beautiful outfits, love all of them. Very cute!!! You have been busy also! Wow! Nice outfits. Between you and Patrice I think you've stolen all the sewing mojo. Love all your outfits! You look great! I have this pattern and its been very useful in my wardrobe also! Have not been by in a minute, but let me know when you begin to contract sew...I KNOW I could not do such a good job! 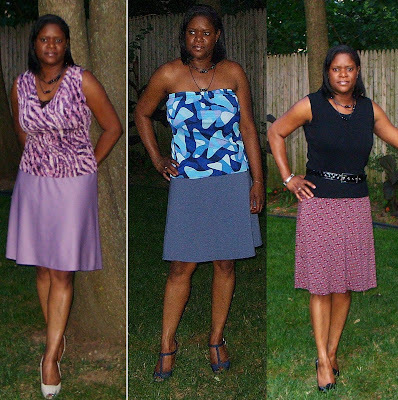 Thank you... for years I've always worn tailored skirts, but with the heat finally upon us - I wanted something easy and super comfortable and those skirts fit the bill. What a great use of a pattern! All of the outfits are great...and you have been VERY busy! Absolutely love how you take a very simple pattern and create beautiful, simple and workable wardrobe. Greattttttttt! What a nice wardrobe. You can mix and match throughout the summer. When the weather changes you can team the pieces up with others you already have. Go! They are all nice, thanks for sharing! You inspire me. Thanks for your persistence and your comment did post, sometimes blogger can be challenging. Those are really great looking skirts!